What is the appropriate verb that I should use to fill in the blank below? People march on parades, but models __ on the catwalk. Alternatively, models (strike a) pose on the catwalk. The models walk on the catwalk. Unsurprisingly. 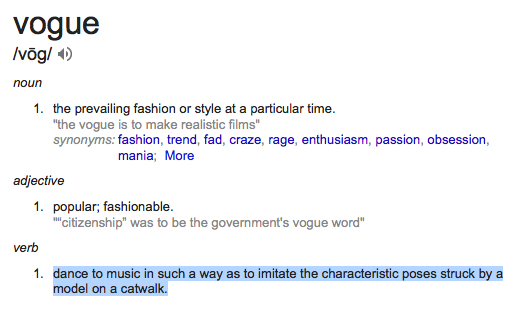 Indeed, from that, one instance of a model presenting an outfit is called a walk as well. You could use the word sashay. I think it can serve in a figurative sense, so they don't have to be walking in any particular way. Analogously, people marching in a parade aren't always marching in the more conventional literal sense (as in military or a marching band), but may just be walking. Models parade on or stomp the catwalk. Alternately, models catwalk on the runway. You can also say to model on a catwalk. They do their little turn, then shake their little toosh. I think strut is actually a really good word. But so are pose and sell. They sell themselves and the outfits. They are in a continuous pose knowing that the cameras are going non-stop. If you want to be elegant about it, I'd suggest "promenade". I instantly thought of Madonna's "Vogue"
Not the answer you're looking for? Browse other questions tagged single-word-requests verbs word-usage or ask your own question. What are the differences between “disseminate”, “propagate” and “spread”? What verb best describes the process of engaging in a debate or argument with someone? What do you call a person who is seeking endorsement (or approval)? Making someone unable to do something . .